A broader range of movies and a different screening night will be on offer as the curtains are raised on a new summer season of Upper Hutt drive-in cinema. More than 80 carloads of movie goers turned out at to Firely Cinemas at Trentham Racecourse on Friday for a back-to- back feature of Jumanji and Mrs Doubtfire. Slight drizzle on Saturday night was not enough to keep away a similar turnout for Frozen and Jurassic Park. This is the second summer that Hutt Valley entrepreneurs Brady Dyer and Jonno Morrissey have brought drive-in movies to Upper Hutt. Several changes are planned for this year’s season. Dyer said Firefly Cinemas was aiming to put on 30 screenings this summer. A broader range of movies and some newer releases would be included in the movie lineup. Dyer said he was talking with Trentham Racecourse management about the possibility of relocating movie showings to a larger space within the racecourse. Movies would be played on Saturday nights rather than Sunday nights in response to customer feedback. “We were trying not to compete with Saturday night activities but we’ve come to learn that [the drive-in movies are] on a par with a lot of the Saturday activities already out there,” Dyer said. Of the 17 Firefly Cinema screenings put on last season, Brady said only one screening was postponed. Upcoming movies: Sunday, October 5, The Lion King, 7.45pm, The Matrix, 9.45pm. Tickets are $30 per carload per movie. 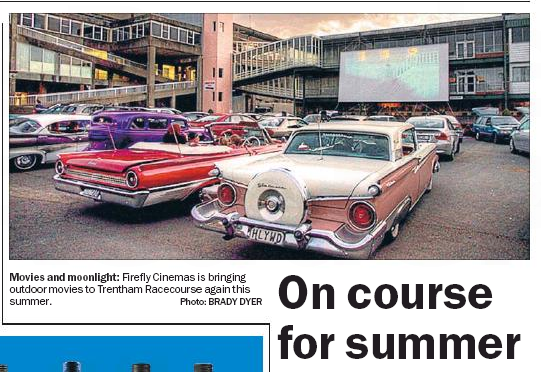 All movies screened at Trentham Racecourse, 10 Racecourse Rd.